In case of late cancellation or no show first night will be charged by credit card. 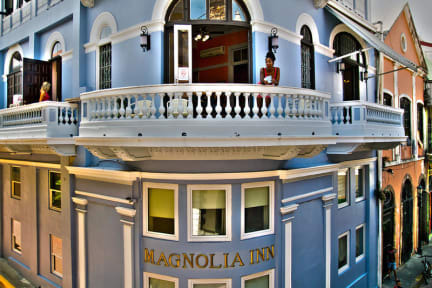 Magnolia Inn is located in the heart of Casco Viejo, Panama City's historic neighborhood. 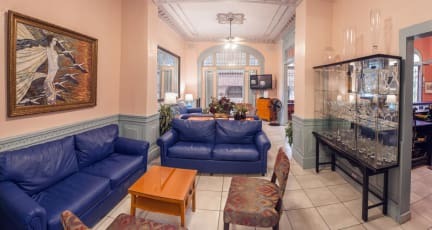 This charming hotel offers comfortable and spacious deluxe private rooms as well as luxury hostel rooms. The restored French colonial mansion is full of historic character, as well as modern conveniences such as A/C, orthopedic beds, free Wi-Fi Internet and safe deposit boxes. Loved this place! In such a great, historic area. The shared spaces were very clean, the AC worked great in the heat, and the bathrooms were always clean & tidy. Really great value for your money and I would recommend to anyone. The only slight bad thing I could say is that sound really travels in this space, so bring ear plugs as you'll definitely hear louder people if they are not considerate. The best hostel I’ve ever stayed. Better than many hotels in Panamá. Very clean, cosy and at prefect location. Every detail is perfect. I would recommend to everyone. Superb hostel. The best I've ever been to. Excellent on all aspects. I highly recommend this place if you are staying in the old town section of Panama City. Stay twice at magnolia on either side of a San Blas tour. It was the perfect hostel for staying in the city, location in casco viejo cant be beat. Dorms were quiet (friends in other hostels couldn’t sleep because of the noise), clean and comfortable with lockers. Front desk was 24hrs, full kitchen and cozy common area. Would stay here again for sure. I admittedly haven't stayed in too many hostels; but this one seemed more than adequate, especially for the price. All of the necessary amenities were available, and it felt safe and clean. I even made a new friend while staying here! The staff was very helpful. Joseph one of the front desk guys gays gave exceptional service. place was very clean and comfortable. We loved staying here! The only downside is that you cannot lock your room door, and you need to buy your own lock for your personal locker. Aside from that, everything was great! The common spaces/kitchen were clean and open, and they have great private bathrooms/showers. Looked for a non party but social option in Casco Antiguo of Panama City and found it at Magnolia Inn. Facilities are safe, clean, 6 bed dorms have not too cold AC and comfortable bunks, lockers are available, and the lobby is great for a chil. The staff is nice and helpful, but a bit more reluctant than on other hostels I've been, but that's all ok. Location is superb. Overall I would definitely come back to Magnolia.